J&K encounter HIGHLIGHTS: Deputy Commissioner Pulwama, Ghulam Mohammad Dar said, "I have been informed that seven people were killed in clashes that broke out near the encounter site. We are collecting further details." Seven civilians were killed Saturday in clashes that broke out between youths and security forces in Jammu and Kashmir’s Pulwama district following an encounter with militants in the area. At least one Army jawan and three militants have been killed in the ongoing gunfight. Deputy Commissioner Pulwama, Ghulam Mohammad Dar said, “I have been informed that seven people were killed in clashes that broke out near the encounter site. We are collecting further details.” Mobile internet services have been suspended in several parts of the Valley. The encounter began this morning after security forces launched a cordon and search operation in Sirnoo village of Pulwama after receiving specific intelligence inputs on the presence of militants in the area. As police were conducting searches, the militants opened fire on them. An army jawan, three militants killed in ongoing Pulwama encounter in Jammu and Kashmir. Seven civilians killed in clashes near site. Follow HIGHLIGHTS below. Mobile internet services were suspended in most parts of Kashmir, including in Srinagar in the aftermath of Pulwama incident, officials said. High-speed mobile internet services have been suspended in most parts of the Valley as a precautionary measure, they said. The services have been barred in four districts of south Kashmir, Srinagar, Bandipora and Sopore township in Baramulla and Handwara in Kupwara district. The internet speeds have been throttled in Budgam and Ganderbal districts, the officials added. The mobile internet services are working normally in the rest of the areas in Baramulla and Kupwara districts, the officials said. J&K Police in a statement said that a joint search operation was launched by the security forces based on a credible input about the presence of militants in Monghama area of village Sirnoo in Pulwama district Saturday morning. During the search operation, which was in an open field, militants fired indiscriminately leading to an encounter. A crowd came dangerously close onto the encounter site while the search operation was going and got injured. The injured civilians were evacuated to a hospital where unfortunately seven persons succumbed to their injuries. Others who were admitted to the hospital are stated to be stable. Army personnel who got wounded in the crossfire are being treated at a hospital while one jawan succumbed to his injury. In this encounter, three militants were killed. Bodies were handed over to the legal heirs after completion of medico-legal formalities. Police has registered a case in the matter. Incriminating materials including arms and ammunition which were recovered from the site of the encounter have been taken in for further investigation and to probe their complicity in other terror cases. The loss of civilian lives is deeply grieved. Police once again appeals to the citizens to remain away from the encounter site as it is a prohibited zone which involves significant danger to life because of the nature of the encounter. 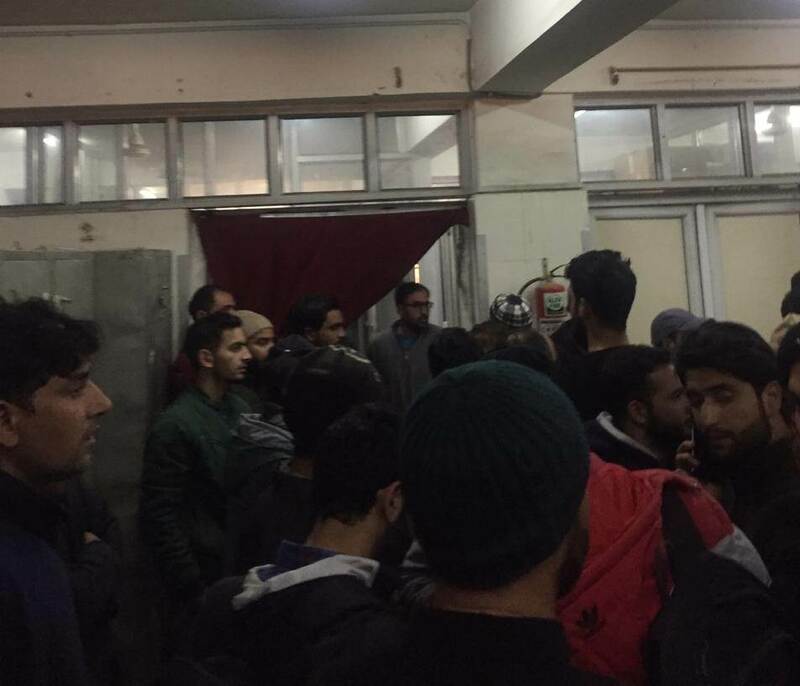 People injured in Pulwama have been admitted to the SMHS hospital in Srinagar. Extending his condolences to the grieving families, former minister and chairman of People's Conference Sajjad Lone tweeted, "Extremely disturbing news coming from Pulwama. The administration needs to seriously evaluate the costs of its operations. If there is even a remote chance of civilians getting killed during military operations it is better to call off such operations. My heartfelt thoughts with the families of those who lost their lives in Pulwama. I just pray that Almighty takes us out of the perpetual state of mourning that we seem to have been sucked into. And also hope that administration abandons its Rambo mindset. The preparedness of security forces would in the Pulwama context be the ability to make the distinction between combatants and non combatants. If u end up killing 7 civilians in order to kill 3 militants. It is time for heads to roll. We can’t afford a state of impunity." Former Jammu Kashmir DGP Shesh Paul Vaid expressing his grief at the loss of lives in today' s encounter wrote on Twitter, "Anguished at the loss of lives of civilians in an encounter in Pulwama. Continued instigation by terrorists and their masters across, for the civilians to reach the encounter site and disrupt the operation by stone pelting leads to loss of precious lives. Terrible." While PTI reported that the civilian death toll has gone up from six to seven, Medical Superintendent, District Hospital Pulwama, Dr Abdul Rashid Parra told Indian Express that total 19 people were brought to the hospital with "firearm injury". “Six of them were brought dead,” he said, adding they referred 11 injured to Srinagar hospital for further treatment. Apart from the seven, dozen others injured, including a youth who's condition was stated to be critical. NC Chief and Former CM Omar Abdullah in a tweet lashed out at Governor Satya Pal Malik for the lack of focus on people's security in J&K and called out his administration for their inability to restore peace in the state. He even cornered the governor over his publicity campaigns. The administration of Governor Malik has one task & one task only - to focus on the security of the people of J&K & restore peace to a troubled valley. Sadly it appears that’s the only thing the administration is not doing. Publicity campaigns & full page ads don’t bring peace. Reacting to the encounter, PDP Chief and former Jammu and Kashmir chief minister Mehbooba Mufti tweeted: "No probe enough to bring back the dead innocent civilians. South Kashmir has been reeling under fear for the last 6 months. Is this what was expected from Gov rule? The admin has failed in securing civilian lives. Deepest condolences to the bereaved." "How long are we going to shoulder the coffins of our youngsters? So many civilians killed today post encounter in Pulwama. No country can win a war by killing its own people. I strongly condemn these killings, and once again appeal for efforts, to stop this bloodbath," she added. No probe enough to bring back the dead innocent civilians.South Kashmir has been reeling under fear for the last 6 https://t.co/yvGQiUPOel this what was expected from Gov rule?The admin has failed in securing civilian lives. Deepest condolences to the bereaved. How long are we going to shoulder the coffins of our youngsters? So many civilians killed today post encounter in Pulwama. No country can win a war by killing its own people. I strongly condemn these killings , and once again appeal for efforts , to stop this blood bath . The encounter comes two days after two militants were killed in an encounter at BrathKalan village of North Kashmir’s Sopore district. Security forces had launched an operation following information on the presence of militants there. Welcome to our Live blog. An Army jawan and three militants were killed in an encounter in Jammu and Kashmir’s Pulwama district on Saturday. Six civilians were also killed in clashes that broke out near the encounter site. Follow LIVE updates. Saturday's encounter comes two days after two militants were killed in an encounter at BrathKalan village of North Kashmir’s Sopore district. Security forces had launched an operation following information on the presence of militants there. According to police, the encounter had started after militants opened fire at the security forces. On Tuesday, four Jammu and Kashmir policemen were killed in a militant attack on a police picket in South Kashmir’s Shopian district. The attack was a first by militants in the Valley after they suffered several blows in multiple encounters over the last one month in South Kashmir. Police officers said that the policemen who were killed were guarding a picket meant for the security of a few Kashmiri pandit families living in Zainapora area of Shopian. Four weapons belonging to the policemen were also taken by the militants after the attack, officials said. The four policemen were identified as Abdul Majeed, Mehraj-ud-din, Anees and Hameed-ul-lah.